I have a Windows Server 2008 R2 domain controller running DHCP, DNS and of course ADDS. I figured out the issue (although I would have never of suspected it) moments before the error, I was reconfiguring the DNS IP address for a scope against my DHCP server. Below is the DHCP scope editor for DHCP in Windows Server 2008 R2. This is a fairly old box which I haven't changed that much over 2 or so years and it is used by many devices/machines. Searching the web didn't really give any firm solutions other than to rejoin to the domain. so I tried that and it worked. I think it would be a good idea to raise a bug report for this. LWAUG - what a mouthful! As mentioned in an earlier post, I attended the LWAUG first meeting on Tuesday night in London. I thoroughly enjoyed it and learned a lot from it. I also found it particularly useful talking to various folks during breaks and after the talks - as I do with most user groups, engaging with members and exchanging experiences/knowledge is one of the reasons I attend. Sadly though, I could only stay for Richard Conway's talk on Service Management API's in Windows Azure. Service Management API's allow you to programmatically create and deploy services into Azure. I missed Andy Cross's talk on diagnostics as I had to get back to Norfolk, I didn't get home until 00:30am. Andy's slides can be obtained here: http://lwaugbe.blob.core.windows.net/talks/Fluent%20Diagnostics%20Dec%2011.pptx. (note the use of Azure blob storage to store the files!). I am told some of the service management API's as demoed by Richard are undocumented. Everything talks via REST in Azure, sorry SOAP folks, nothing to see! REST is removing all the fluff you get with SOAP. SOAP just doesn't scale when you're trying to consume services over constrained low-bandwidth networks such as EDGE and GPRS. As we have a ever so increasing breadth of varied connected devices, i.e. net books, smart phones, laptops, PDAs, tablets etc this is a very big deal. So I'm glad the Microsoft Azure architects stuck with REST in Azure. Anyway, I think this is a big subject and one we could discuss at a future LWAUG event(s). See here for documentation around Service Management REST API's in Azure: http://msdn.microsoft.com/en-us/library/windowsazure/ee460812.aspx it seems fairly extensive, those messages can easily be sent via Fiddler so you don't need to write anything to play around with the API. Also Richard has uploaded his code used in his demo's here: http://lwaugbe.blob.core.windows.net/talks/HostedServices.etc.zip definitely worth looking at if you want to auto-deploy your Windows Azure services into Azure Compute via mechanisms like continuous deployment for seamless integration for your testers and developers. I'm looking forward to the next meet. Tomorrow night (6th December 2011) I'll be attending the new London Windows Azure User Group meeting near Liverpool Street. I learn't about it when I attended the recent Windows Azure Bootcamp run by Steve Planky due to the fact that the person that was mean't to go couldn't due to sickness, so I went instead. I plan to do future presentations for this group and looking forward to it. There is another Azure user group called UK AzureNet that started in 2009. Lately it has been rather quiet so it's good to see some interest in Azure once again in the community. I don't really care that GitHub has more repositories or has more traffic or is more popular than X in this case BitBucket. All I really care about is features, and I think BitBucket has more of them. I recently read this post: http://www.pocoo.org/~blackbird/github-vs-bitbucket/bitbucket.html that talks how GitHub is identical to BitBucket except according to Google, GitHub has a much larger community than BitBucket. I think that goes without saying. There is even support for GitHub in linkedin so you can link your repositories to your linkedin profile - I like that. However with GitHub you have to pay for things like; disk space and private repositories. Well, you do get 300Mb free with GitHub - with BitBucket there is no limit. I need to elaborate on this a bit more. GitHub says these limits are "Soft Limits" and this is to prevent abuse, abuse from what!? adding everything I have ever written to a repository perhaps! With GitHub the Web UI is just not very intuitive. For example, I was just trying to create a repository, and I'm still trying to figure out how to do it. This could be because I do not have a credit card on file. When clicking "Repositories" I'd expect some kind of link, or button to create a new repo or something. With BitBucket this is so much finer, I find it a lot more intuitive and I don't have to enter a credit card unless I need to exceed the 5 free contributors I got when I signed up. Another feature I really like with BitBucket (not sure if you can do this with GitHub) is import repositories from other source control systems such as Git, Mercurial or SVN. You can also create new repositories using Mercurial or Git. And finally, I like that fact with BitBucket the ability to use a custom internet domain for all my repositories. For example I've set a CNAME record: http://code.simonrhart.com/ to resolve to bitbucket.org. And it just works, navigating to my above sub domain, resolves to my BitBucket account. So remind me again why I'd use GitHub over BitBucket? There used to be a link on the MSDN subscription page but it has seemed to have been moved so I wrote this blog post so I never lose it again and hopefully inform others. The benefits vary depending on your level of MSDN subscription. For example ultimate users get 1500 compute hours per month - I think that is pretty good. I got billed because when Azure went from CTP to RTM, they started charging customers, no surprise there! 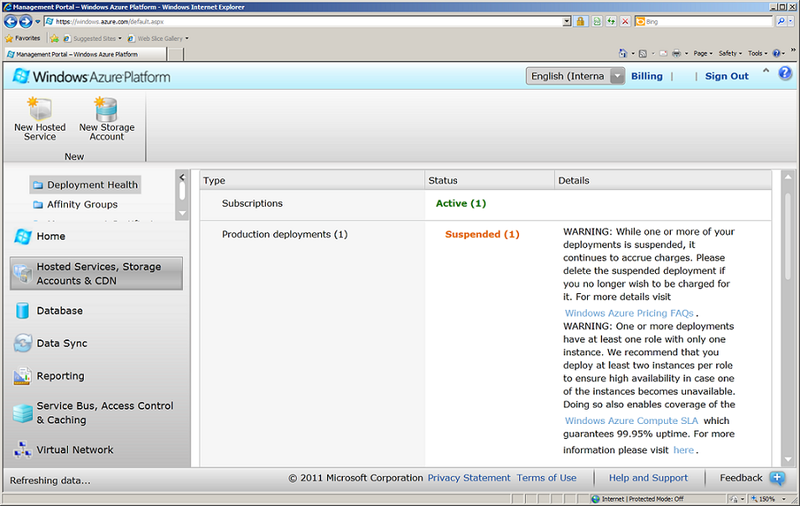 but because I forgot I had some demo services deployed in Windows Azure, I got charged. So I quickly deleted them. I started using Windows Azure compute again - historically I've only used Windows Azure AppFabric which in most cases doesn't use Windows Azure Compute - i.e. you don't normally host any custom services in Windows Azure, instead you use the service bus to relay messages back to your on-premise data centre. ﻿﻿﻿﻿﻿﻿﻿﻿So now it is fairly explicit, so no excuses people, when you get billed for deployed disabled services, don't complain! To stop billing from occurring, you need to delete the services using the management portal entirely, that is of course you don't intend to use those services. Heads up on the new portal, I like it, it's a much improved user experience over the old multi-site portal for each SQL Azure, Windows Azure and Windows Azure AppFabric. Now management it done under one portal site.